It's a simple question without simple answers. During an SMT Live tweetchat last month, which I co-hosted, community builders from around the globe cited several ways businesses can reap what they invest in online communities. I've been focused on this question for more than two decades, driven to better understand the ways organizations derive benefits from their communities. Through my research, I've identified six distinct ways that firms can benefit from community, and serve their customers better. Especially today, as software-as-a-service and other cloud-based systems grow, businesses' utilization of the installed software they've bought has become more important (according to Flexera Software's 2016 Software Monetization and Licensing Survey, 51% of executives at software manufacturers and users admitted they don't track customer usage). Here, communities can be instrumental in helping increase customers' understanding of the products they purchase, troubleshoot problems when they occur, and ultimately increase customer use and value of products and services, improving their asset management practices. Through online communities, organizations can learn more quickly about the things their customers wish they had from their existing products and services, rather than waiting for the annual customer conference or satisfaction survey. When an organization engages in sustained collaboration with their customers, it can create better roadmaps for future products and services. When forward-thinking organizations leverage community early in the customer journey - when potential buyers have questions, need to learn from existing customers about their experiences, and are weighing their options - communities can be the perfect place to bring pre-sales leaders and potential customers together. What customer would want to wait to talk to a support professional when he or she can self-serve through a support portal and customer community, getting answers (and experiential "how to" details) from others? Here alone, communities can reduce support costs and increase customer satisfaction. While there's a time and place for public social media campaigns, many organizations prefer to hold their deeper customer conversations in private settings. This keeps competitors from gaining too much information, while also enabling the organization to foster sustained support and engagement. Thanks to all who participated in and contributed to the recent SMT Live Tweet Chat. There's much more to talk about. 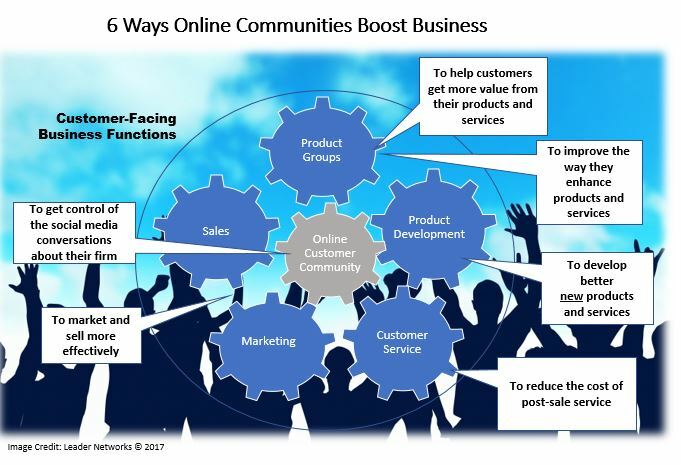 How have you seen businesses benefit from online communities? I welcome your feedback.